+972 Magazine talks to Khalil Shaheen, a Gaza resident and expert on the impact of Israeli, Palestinian Authority, and Hamas policies in the besieged coastal strip, to get a picture of what life is like in Gaza, and why it’s probably going to get unfathomably worse. In addition to sewage that flows into the sea untreated, and hospital ICUs that must rely on gasoline-powered generators, the power shortage also has dire consequences on everyday life in regular households. Without electricity, the pumps that deliver tap water to apartments in high-rise residential buildings stop working. Israel pulled its troops out of the Gaza Strip a little over a decade ago, but its military retains effective control over many aspects of life in the coastal enclave. The Israeli army still controls the Strip’s land and maritime borders, decides who and what may enter and exit, blocks basic technologies like 3G cellular broadband from being installed, and has launched three military operations that left thousands of Gazans dead. 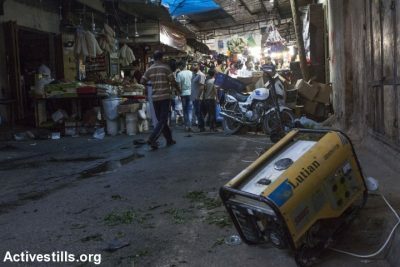 Israel also sells Gaza the majority of its inadequate supply of electricity. Shaheen, who is the director of the Economic and Social Rights Unit at the Palestinian Center for Human Rights (PCHR), one of Palestine’s most prominent rights groups, monitors the impact of Israeli, Palestinian Authority, and Hamas policies on life in the Gaza Strip. “I’m afraid that with the ongoing situation, Gaza will be unlivable by the end of 2018,” he said in a telephone interview earlier this week. Can you talk about what is happening on the ground in Gaza right now? I can’t even describe Gaza as a prison, because even prisoners have fundamental rights. Gaza is an isolated area under occupation, where people aren’t allowed in and out. There is an electricity crisis that leaves millions without power for hours every day, 97 percent of Gaza’s water is undrinkable, there is not enough electricity to provide basic sanitation needs. Israel and the Palestinian Authority are trying to prevent patients in need of emergency treatment from entering the West Bank or Israel. There are shortages of medication and treatment. It’s a catastrophic situation. The Israeli occupation’s policies manifest in our daily life. This is true not only regarding the three last wars on Gaza and the ongoing siege; it includes the policy of splitting West Bank (including East Jerusalem) from Gaza. What about the current water crisis? It is so bad that there are people who are live in high-rise buildings that simply do not have access to water. There is not enough electricity to pump water from the ground [level] to people on the higher floors. Water used to reach these houses between 2-3 hours every few days. And this is in the summer. Yesterday, my building only had one hour of water. Meanwhile the municipality is trying to ration water to different areas of Gaza. Remember that all this is taking place as 60 percent of Gaza’s population are unemployed, and 80 percent is dependent on aid. A week ago Oxfam stopped distributing aid packages due to financial issues, which will affect 30,000 people. What is Gaza usually like in the summer? Usually it is full of life. But nowadays it is all darkness. You walk in the street with darkness. The only solution is the beach, because it is the only area where you can find bits of light from generators. But people are afraid of the sewage. Usually you’ll find thousands of people swimming in the water in the summer. Today you can barely find a few because they are afraid of the toxicity. Who do Gazans blame for the current crisis? Both Israeli policies to isolate Gaza and the internal conflict between Palestinian Authority and Hamas have caused this suffering. Gazans pay taxes to both the PA and Hamas, and yet they hardly receive services from either. They believe that both sides have failed to show any political will to end the conflict, reach unity, and give Palestinians access to all basic rights. Meanwhile, the rivalry stokes a culture of fear. PA employees in Gaza are afraid to criticize Abbas, and Hamas employees are afraid to criticize Hamas. The poorest and most marginalized are resorting to living off bread and tea only. I’m afraid that with the ongoing situation, Gaza will be unlivable by the end of 2018, not 2020 as the United Nations previously predicted. Gazans cannot enjoy culture, they cannot go to the theater or to the movies. This makes life impossible. The world must remember that isolation breeds extremism and terrorism. I cannot imagine that the international community supporting isolation while at the same time wanting people to be more moderate and open. The occupation authorities are putting people inside a bottle and closing it, only opening it up when all the air is nearly gone by easing the collective punishment to allow hundreds of people to exit or to allow some goods and commodities to enter into Gaza. There have been some political changes taking place in Hamas, and I hope the party will change. But there have been no real achievements. Hamas should think about the population in Gaza to allow them to live in dignity. The people of Gaza are a free and moderate people, they believe in tolerance. This was an underlying current of Gazan culture way before the Palestinian Authority ever existed. But when you prevent people from working or traveling and exploring normal life outside the Gaza, it affects people’s lives and leads them to depression. The most challenging issue is the fact that Palestinians are losing hope day by day. They want a normal life like all nations and all people worldwide. But the problem is that day by day they are losing hope. And when you lose hope, things becomes very, very bad.